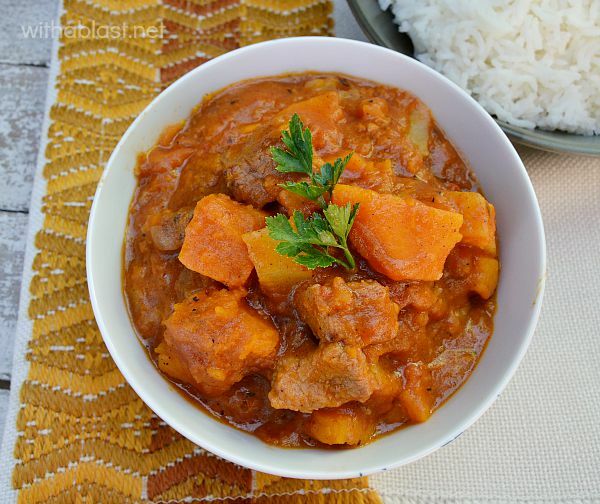 I love a good stew, anytime of the year and this Beef and Pumpkin stew is always perfect for the chillier evenings, such as what we are having right now in SA. At first I thought the weather is doing a whole skip on Spring, which started on September 1st, as it was hot as mid Summer during the first week already. Now, it seems to change by the day, a drop of 10 deg Celsius from day to day (or an increase) is becoming the norm nowadays which makes it a bit difficult to plan menus in advance. During the week I do not go by a menu, more like whatever we are in the mood for on that specific day. But I like to plan well for the weekends as the kids are in and out all the time. That is when a recipe like today’s stew comes in very handy, not too rich for warm weather, but still a bit comforting if it happens to be a chillier evening. I chop the Pumpkin cubes fairly large. About 2.5cm (one inch) square. 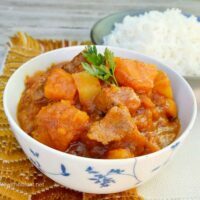 But the Potato smaller as it takes a little longer to cook if all is the same size and you might end up with a mushy Pumpkin stew. The recipe would work just fine with Pork as well, just change the Beef Stock to Vegetable- or even Chicken Stock. 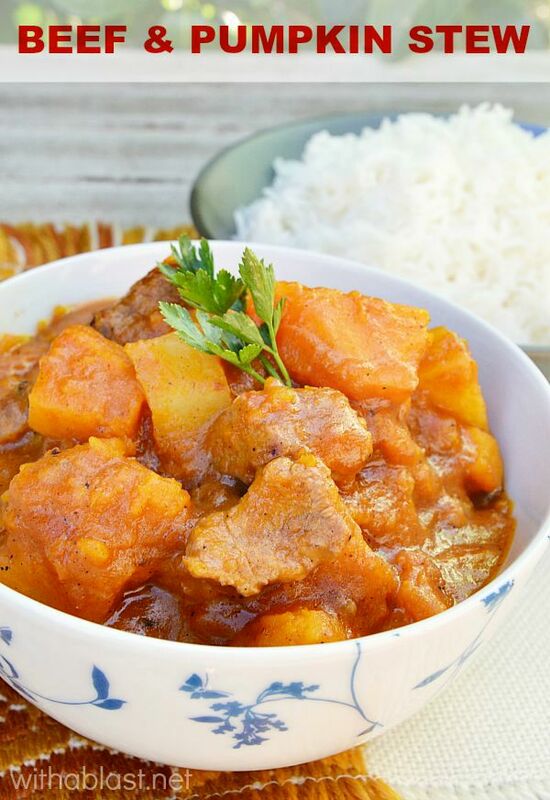 I have not tried this particular combination of stew with Chicken yet, but I am sure it would turn out just perfect. Serve over rice, mashed potatoes or pasta. This sounds perfect for the changing weather here in the States too! I've made pumpkin soup before and I love it, but I've never had it with beef. This sounds great and much more hearty than the soup I've made in the past. Thanks for sharing!